Although our main focus is beef, we also raise small quantities of organic roasting chickens (certified by FVOPA), which are also SPCA certified. As far as we know, we are the only source for organic chicken which is not only certified but also 100% soy-free and SPCA certified, in the Lower Mainland of BC. Why soy-free? Soy products are increasingly controversial among experts, some saying soy is unhealthy, others saying it's okay. Rather than enter the debate, we thought we'd produce a soy-free chicken for those customers that are trying to avoid soy. 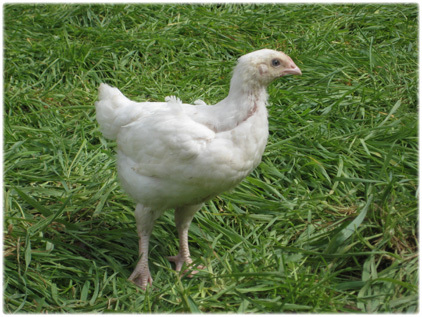 Because we've eliminated soy from their diets, the chickens grow more slowly. But to us, that's okay. The wait is worth it. The result is a wonderfully tasty, moist, delicious roasting chicken that is filled with healthy nutrients for you and your family. And by the way, we also sell chicken "by-the-part" so if it's just breasts (or wings, or...) that you want, we've probably got it. 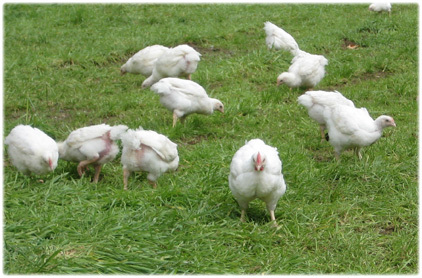 Because we raise our chickens organically, they have plenty of wide-open space in a stress-free environment, are fed organic feed, with plenty of natural sunshine and no growth stimulants or chemicals of any kind. The result is, we believe, the best tasting and healthiest roasting chicken you can buy.